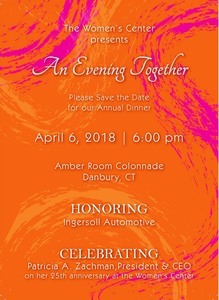 Women’s Center of Greater Danbury (WCOGD) Announces Guest Speaker Michelle Pranger for spring 2018 annual fundraising dinner, An Evening Together, slated for Friday, April 6, at Danbury’s Amber Room Colonnade. The Women’s Center’s annual dinner is next Friday, April 6. We look forward to welcoming our Guest Speaker: Michelle Pranger, a resident of Newtown, CT. With more than 15 years of experience as an author, motivational speaker and educator, Michelle Pranger continues to touch the lives of countless children and adults alike with her inspirational words and powerful story of survival of childhood abuse. Through her book, “A Child’s Voice: One Girl’s Journey to Discover her Voice and be Heard,” Michelle offers a story of unparalleled perseverance that serves as a forceful reminder of the power contained within each of us to overcome and prosper amid dire circumstances. Michelle’s book can be purchased prior to the event here. Books will also be available for purchase at the event. With her background as an elementary school and special education teacher, Michelle honed her skills as a compassionate advocate for those struggling through hardship and trauma. Michelle currently is a teacher at John Read Middle School in Redding, CT. Today, Michelle utilizes those skills to deliver a universal message of personal growth that is truly unique. From humble roots, Michelle began sowing the seeds for what would become a lifelong passion to educate, to inspire, and to help others in their quest for personal transformation and growth. Michelle’s story ties in nicely with our celebration of 43 years of #givingvoice to our communities. After a childhood of abuse she found her voice through the kindness and generosity around her. In addition to having Michelle as our speaker, we have fabulous live and silent auction items to bid on, including two front-row seats to a Billy Joel concert of your choice, US Open tickets to opening night, a special stop at your house from Santa on a firetruck and so much more!